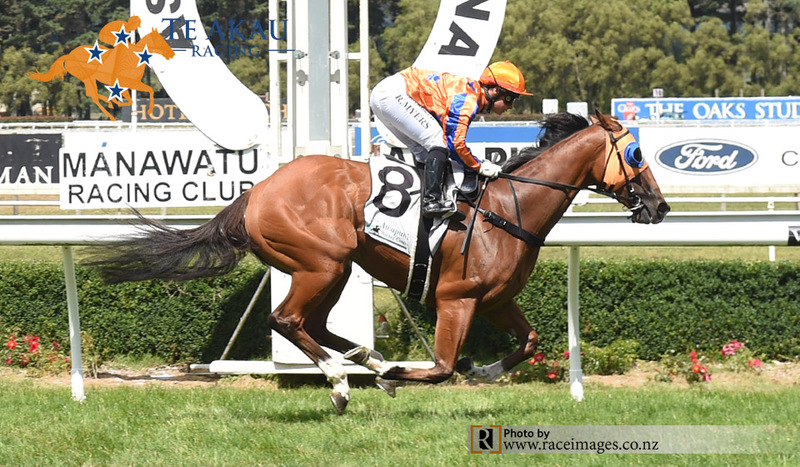 Queen of The Air (3 f I Am Invincible – Flying Single, by Flying Spur) produced a performance fitting of a $1.60 shot when bolting away with the $22,500 Aranui Harvesters Rating 65 1200 metres on 8 February at Awapuni. Looking big and bold in her preliminary, following a second at the trials on 22 January at Matamata, Queen of the Air went forward to lead at the 700m, travelled best under Rosie Myers turning for home and proved a class or two above her rivals when racing clear to win by five lengths. Having created a favourable impression winning her first trial as a two-year-old, Queen of the Air did what few would think possible when winning her Maiden in track record time (1:09.6) for 1200 metres at Waverley, beating subsequent Eulogy Stakes (Gr. 3, 1550m) winner Queen of Diamonds (Savabeel) by nearly four lengths. True to form, she stopped the clock at 1:09.2, last 600m in 34.2 – a feat few in this grade can achieve. Now the winner of two from six for the Te Akau Supersonic Syndicate (Mgr: Karyn Fenton-Ellis MNZM), Queen of the Air was purchased by David Ellis for $240,000 at the 2017 Gold Coast Yearling Sale, after being high on the list during inspections. “She was very impressive and any filly that breaks a track record winning a Maiden race indicates an enormous amount of potential and she could have a crack at black type shortly,” Ellis said. “Jamie (Richards) and the team have done an excellent job getting her to this level, adopting a patient approach and the owners are being rewarded. “She’s got a really good bunch of owners. Some newer owners came into the horse and others that have been friends of mine for a long time. Queen of the Air is developing into a valuable filly. Her dam, Flying Single, is a half-sister to the stallion Not A Single Doubt (Redoute’s Choice) and Bella Sunday (Sunday Silence), the dam of Flight Stakes (Gr. 1, 1600m) winner Oohood (I Am Invincible), while second dam is the well related Rory’s Jester (Crown Jester) mare Singles Bar, a half-sister to four stakes’ winners including Snippets (Lunchtime). Queen of the Air notched the 62nd win this season for trainer Jamie Richards: sitting second on the leader board and first in prize money. “It was another impressive win by the filly,” Richards said. “She’s had a few little immaturity issues and we’ve had to back off her after the win at Waverley, where she beat a very good horse (Queen of Diamonds). “She had spelled and trialled well, coming to hand nicely, and we were pretty confident she would run well, and Rosie (Myers) gave her a lovely ride. She didn’t overdo it to make the lead, got over nicely, slowed them up to get a cheap sectional and I thought she quickened up really well. Ellis also reported on the recently purchased yearlings, now at Te Akau Stud. “Shares are being snapped up by owners and Karyn (Fenton-Ellis) is doing an unbelievable job communicating with everyone,” he said. “We’ve had a lot of visitors to the farm. My colts’ syndicate was filled earlier in the week and we’ve fully sold 28 horses, so far. Avantage was a Karaka Million and Group One winner on her way to being named Champion Two-Year-Old, and Sword of Osman is a Group One, Two, and Three winner. Queen of the Air was strapped by Kate Belsham. “Kate’s a young lady with a terrific background in racing (father Paul Belsham was a rider and trainer) and she’s doing a great job for us. She is a very capable horsewoman, has social media skills, and someone I’m really proud to have in the team,” Ellis said.